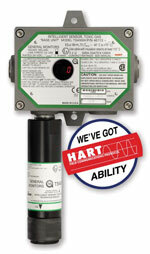 The TS4000H Intelligent Toxic Gas Detector from General Monitors is compatible with HART communication protocol. The detector offers protection against a wide range of hazardous industrial gases, including chlorine and hydrogen chloride, and is able to safeguard against oxygen deficiency. Designed for use in waste and wastewater treatment sites, the device features event logs, an LED display and explosion-proof housing. The system displays gas concentrations up to 500 ppm, fault codes for troubleshooting, and prompting when calibration is needed.